ShanghART Singapore is pleased to present the gallery’s first solo exhibition by Boedi Widjaja, featuring new and existing works from his Stone telling (2011- ) and Imaginary homeland (2015 - ) series. The presentation highlights Widjaja’s practice of tracing, mark-making, drawing and writing as interlaced, conceptual processes; as well as his extended research into the image negative. The Stone telling series looks at geological material transposed as marks—the artist’s proto-writing of land, water and time. Since his first encounter with the red stones of the historic Fort Canning Hill, Singapore, Widjaja has continued to incorporate geological material from international sites in hispractice. In his latest Stone telling works, however, the material stone is absented from the process. Instead, through frottage, the artist migrates graphite from transfer sheets onto paper, and simultaneously makes a positive image and its negative. The rubbing, pressing movement invariably records traces of the physical process as the artist’s fingerprints are imprinted on the work. Graphite transfer sheets also feature prominently in Widjaja’s new works for Imaginary homeland. Continuing his research into the image negative, the artist uses large carbon sheets to trace and transfer wuxia (martial arts) film stills. Wuxia film is a form of Chinese diasporic cinema that the artist grew up watching in the 1980s. Widjaja’s frame-by-frame contemplation of major combat scenes is expressed in the 10m long installation Imaginary homeland: kang ouw  (二). Each side of the canvas carries a riven part of the image duality. Alongside wuxia, ancient Javanese poem hana caraka is a significant conceptual influence in the work. The mythical origin of the Javanese script, the poem consists of four short lines, and is a perfect pangram of the Javanese alphabet as each letter appears once. It tells of two warriors who duelled till death. Kang ouw is Hokkien spelt in Dutch phonology. 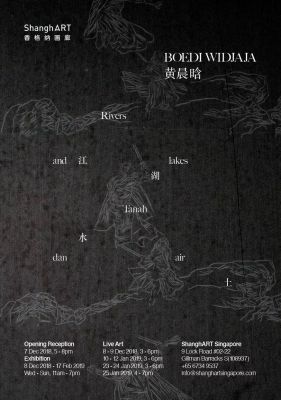 Spoken amongst Indonesian Chinese, it literally means “rivers and lakes” or jianghu in Mandarin; a territory that is marked not with geographical lines but in the minds of its actors; a psychological land of wandering swordsmen in wuxia films. The heart of the exhibition, ‘live art’ and textual work Rivers and lakes Tanah dan air,  echoes hana caraka. The artist wrote a bilingual poem of four lines, “Rivers and lakes / Tanah dan air / Land and water / Sungai sejarah”, which were re-ordered in 24 permutations, creating 24 poems. Each line, consisting of geographical features and elements, contains multiple cultural associations. The artist recorded the voice of his father reading the 24 versions of the poem. His father also wrote the text that he read. Across several days during the exhibition, the artist will shuffle a playlist of the 24 voice recordings and broadcast his father’s reading. Widjaja will listen and trace his father’s writing using a transfer sheet, eventually covering the blank 9m wall with this repeated text-as-image. “Rivers and lakes” is a literal translation of kang ouw. And while “tanah dan air” means “land and water” in Bahasa Indonesia, the composite “tanah air” means “homeland”. The exhibition highlights the artist’s two ongoing series and reveals his layered, processual approach to the primordial act of drawing, which includes tracing, mark-making and writing. For Widjaja, drawing is a physical activity that dilates into a metaphysical journey.Through drawing, the artist pulls at disparate materials — histories embedded in geological objects; his childhood memories; speculative origin stories constructed through myths — to re-code them into new forms and futures. Boedi Widjaja (b. 1975, Solo City, Indonesia) lives and works in Singapore. Trained as an architect, he started his career in graphic design, and turned to art in his thirties. His works often connect diverse conceptual references through his own lived experience of migration, culture and aesthetics; and investigate concerns regarding diaspora, hybridity, travel and isolation. The techniques, materials and tools of drawing have become a defining element of his artistic practice. This is expressed through a broad range of media, from architectural installations to text and ‘live art’, with an emphasis on process and bodily engagement. The artist’s solo exhibitions include: “Black—Hut”, Institute of Contemporary Art Singapore, Singapore (2016); “Path. 6, Unpacking my Library 。书城”, Esplanade, Singapore (2014); and “Sungai, Sejarah 河流, 历史, 源”, YRACS-Base, Singapore (2012). He has also shown in numerous exhibitions internationally, including: “Asia Pacific Triennial 9”, QAGOMA, Australia (2018); “MAP1: Waterways”, Diaspora Pavilion, 57th Venice Biennale, Italy (2017); “Jerusalem Biennale: Watershed”, Hamachtarot Museum, Israel (2017); “Yinchuan Biennale: For An Image, Faster than Light”, Museum of Contemporary Art Yinchuan, China (2016); “From east to the Barbican”, Barbican Centre, U.K. (2015); “Art Jog 8: Infinity In Flux”, Taman Budaya Yogyakarta, Indonesia (2015); and “Bains Numériques #7”, Enghien-les-Bains, France (2012). Recent accolades include: Top 10 Winner, FID Prize (2017); Finalist, Sovereign Asian Art Prize (2015); ArtReview Asia FutureGreats (2014); Grand Prize (Sound Arts; with David Letellier), Bains Numeriques, France (2012); and First Prize, Land Transport Authority Beauty World Station (2012).